AideRSS lets you filter the RSS feed of your blog or site. It ranks the items in your feed according to relevance and reaction using it's PostRank algorithm and presents a filtered list of your top posts. According to AideRSS, "post rank scoring is based on the "5 Cs" of engagement: creating, critiquing, chatting, collecting, and clicking." In other words, how many comments the item has received, how many times it was clicked on, and how many times it's been bookmarked or shared in social media like Twitter and del.icio.us. Click the "Sharing and Widgets" tab and you'll be taken to a page with the code and feed URLs you need to insert in your template / layout. Choose from "best hits," "great posts," "well received," or "full feed." You can preview each before you decide. You can even post links to all the categories via a widget and let your readers subscribe to whatever they want. You can see the feed in action to the right, under "Most Popular." I right clicked the "great posts" link and copied the feed url. I then created a new "feed" page element for my Blogger layout. Try it out and let me know what you think! ...And don't forget to enter our giveaway for a chance to win a copy of the book, The It Girl's Guide to Blogging with Moxie. 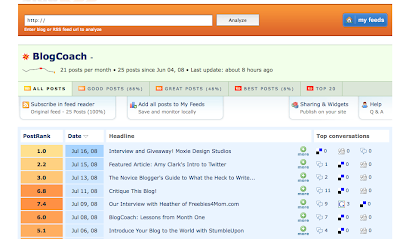 Just click here (join if you need to) and look for BlogCoach Giveaways at the top of the list of boards.